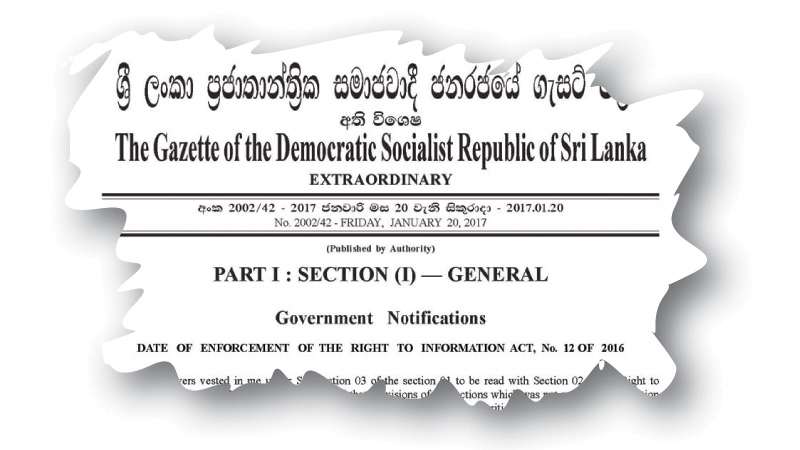 The extraordinary Gazette announcing the date of enforcement of the Right to Information Act as February 3 has been published. The gazette had been published last Friday. Under the RTI Act, ministries, government departments, public corporations and private organisations carrying out public functions or services, local authorities, any department, authority or institution established by a provincial council, non-governmental organisations that are substantially funded by the government, higher educational institutions including private universities and professional institutions recognised by the state, all courts, tribunals and institutions created for the administration of justice should provide access to information and shall maintain records. The introduction of the RTI was a key pledge of the government. The government when introducing the 19th Amendment to the Constitution recognised the Right to Information as a fundamental right. Parliament unanimously passed the Right to Information Act on June 24, 2016. The Parliament Reforms and Mass Media Ministry is vested with the task of implementing the RTI Act. Information officers are to be appointed to all state establishments to carry out the functions related to dissemination of information.